Richard T Clark (right), chair of Merck (known as MSD outside the US and Canada) retires on December 1, 2011. 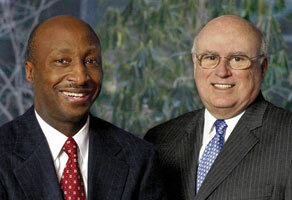 He will be replaced by current CEO, Kenneth C Frazier, who was elected by the board of directors. Clark joined Merck in 1972 as a quality control inspector and became chair in 2010. Other roles at the company have included president and CEO from 2005 to 2010, senior vice president of quality and commercial affairs and president of the manufacturing division. He said: “I have been a part of Merck for more than 39 years – I always have and always will consider Merck to be an important part of my life and my extended family.” As CEO, Clark oversaw the launches of HIV treatment Isentress (raltegravir) and the HPV vaccine Gardasil. He also led the company's $49bn merger with Schering-Plough in 2009. David Meeker has been made CEO of Genzyme, which was bought by Sanofi earlier in 2011, effective from November 1, 2011. Meeker will report to Christopher A Viehbacher, CEO of Sanofi, and joins the group management committee. Viehbacher remains chairman of Genzyme. Under Meeker's leadership, Genzyme will incorporate the rare disease business and the multiple sclerosis franchise. Meeker joined Genzyme in 1994 and was promoted to COO in 2009. Nycomed, which was taken over by Takeda in September 2011, has announced that Jostein Davidsen has been appointed head of emerging markets in addition to his current role as area head of Russia/CIS. He will report to Frank Morich, EVP, international operations (Americas/Europe), Takeda Pharmaceuticals International, and CEO of Nycomed. Davidsen has been leading the legacy Nycomed Russia/CIS area since 1994. The European Generic medicines Association's (EGA) board has elected Gudbjorg Edda Eggertsdottir as its new president. She has been active in the generic medicines industry for over 30 years, with significant experience in the generic medicines sector in companies such as Actavis, where she is president Iceland, strategic projects, and Delta. She has been on the EGA executive board for two years. Eli Lilly is making key appointments due to the December 31 retirements of Bryce D Carmine and Frank Deane. Carmine led Lilly Bio-Medicines and Deane led global manufacturing operations. From January 1, Dave Ricks, president of Lilly USA, becomes senior vice president and president of Lilly Bio-Medicines. Previously he was general manager of Lilly affiliates in China and Canada. Ricks' responsibilities include the US, Japan and Europe. Maria Crowe, senior vice president for global drug product manufacturing, succeeds Deane as president of manufacturing operations. Alex Azar becomes president of Lilly USA. CEO of Shire, Angus Russell, has joined the board of InterMune, Inc. as a non-executive director, with effect from October 31, 2011. Amgen has appointed Anthony (Tony) Hooper as executive vice president, global commercial operations. It has also appointed Robert A Bradway to the board of directors. Hooper will report to Bradway, who is president and COO. Hooper joins after 16 years at Bristol-Myers Squibb (BMS) where he was most recently senior vice president, commercial operations and president, US, Japan and intercontinental. Bradway joined Amgen in 2006 as vice president, operations strategy, and served as executive vice president and chief financial officer from 2007 to 2010. Ralf Huss, previously global head of the Therapeutic Cell Initiative at Roche, has joined the management board of German-based Apceth. He is a Professor of Pathology and Adjunct Professor for Regenerative Medicine at Wake Forest Institute for Regenerative Medicine in Winston-Salem in the US. Current president of generics firm, Mylan, Heather Bresch is set to become CEO, taking over from Robert Coury, who remains as executive chairman. Mylan COO Rajiv Malik, who joined the company with its buyout of Matrix Laboratories, takes Bresch's current job. Bresch was appointed to the board in March 2011. France-based bio-pharmaceutical company Hybrigenics has appointed Dr Alain Munoz to its board of directors. Dr Munoz replaces Dr Bernhard Ehmer, president of ImClone Systems and will chair the clinical advisory board. He has over 20 years' experience in the pharmaceutical industry at senior management level with the Sanofi Group and the French pharmaceutical company Fournier. Dr Angelika Bodenteich has been appointed head of development at Austrian company Marinomed Biotechnologie, which develops innovative therapies for respiratory diseases. She joins from Onepharm Research & Development and has more than 15 years of experience in the pharmaceutical industry. She is a trained pathologist who has worked in Austria, Norway and the US. chair of the National Associations Network); Donald Munro (Rayner Intraocular Lenses) and Renaat Vermeulen (Biomet). The Drug Information Association (DIA) has appointed Kaushik Desai as director of DIA India. He has a deep knowledge of the global regulatory framework and the pharmaceutical environment in India and is a trained pharmacist.